One of our favorite holiday traditions is Milk Punch. While the boys in the family could survive on Egg Nog and pumpkin pie from Thanksgiving until New Year, the girls here prefer Milk Punch, which is actually a traditional New Orleans drink. We are not in the least bit southern, but more than a decade ago, the recipe I found in Food and Wine proved too good to resist, and I’ve been making it every year since. Be warned: this drink packs a punch. If you serve it at a party, which we always do, make sure there are designated drivers. But, the beauty of it is that you can whip up a batch sans bourbon for the kids. They’ll love it. It’s pretty and it smells delicious. Generally , we have a pitcher of the real stuff and pitcher sans alcohol in the refrigerator in the week leading up to Christmas. If 2 batches seems excessive (but it isn’t because it is that good), you can keep a pitcher without alcohol and add the bourbon to taste as your pour your nightly glass. We’re glad here for the rain. We need it, and it’s a good excuse to cozy up to the fire with a glass of pure joy. 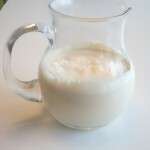 http://www.learningtoeat.com/2009/08/making-drinks-kid-version/ — happened to invent their own (non-alcoholic) version of it this summer and continue to make “milky drink” nearly every day. Thanks for posting the recipe Lisa. I can’t wait to try it!